David Lindsay (1876-1945), born in Lewisham in London and dying in Shoreham in Sussex, is frequently described as a “Scottish writer”: his father (who abandoned the family early on) was indeed Scottish, but Lindsay himself did little more than spend holidays there, mostly near Jedburgh, in the years before 1914—and his mother was from Warwickshire. David Lindsay dedicated himself to his writing from 1918, though with very little success. Although both C.S. Lewis and J.R.R. Tolkien praised his novel A Voyage to Arcturus (1920) it is only in more recent years that it has been accepted as a classic of the science fiction and fantasy field; it is a book which bemuses as much as it inspires. The Encyclopedia of Science Fiction calls it “a tale whose apocalyptic intensity—and whose refusal of any balm or loving-kindness as its protagonist scours an alien world in search of a savage Transcendence—marks it as a work written in the aftermath of World War One; the last word of the book, the true name of the deformed Virgil figure who goads the protagonist to the stars, is Pain.” Clute must mean “the last word spoken in the book”; because (as Caroline Webb pointed out to me) the last actual word is “darkness”: which is perhaps equally appropriate. 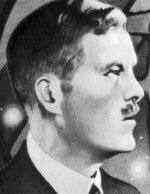 Most of his other books—The Haunted Woman (1922); Sphinx (1923), about the invention of a machine to record dreams; Devil’s Tor (1932)—have elements of science fiction and/or fantasy about them. Lindsay was the youngest of three, brought up with his brother Alexander and sister Margaret by his mother and aunt. His father disappeared from the scene early on: he migrated to Canada, leaving his wife penniless. Lindsay was a good pupil at Lewisham Grammar School, but the family could not afford to send him to university. His brother went into business in the Midlands; his sister worked in the Post Office; and he was employed by insurance brothers in the City. He moved up from office boy, in 1894, to a position of some responsibility by 1916, and continued to live with his aunt and sister, until he enlisted in 1916. In 1916, Lindsay married the eighteen-year-old Jacqueline Silver, by whom he had two daughters. In 1918 he resigned from the insurance brokers (who had kept the job open for him, and offered him promotion), in order to concentrate on his writing. He had problems finding publishers, and they had problems finding purchasers. They lived initially in Cornwall, moving to rural Sussex in 1928, and then to a town house in Hove, Sussex, in 1938, where they tried to make ends meet by running a lodging house, catering initially for French students of English and then for young naval officers. Once, during the Second World War, while David Lindsay was having a bath, a bomb fell near the house, and he was wounded by a splinter of glass and lost a lot of blood. In June 1945 he had an abscess on a tooth, which was not treated. The death certificate noted “haemorrhage due to erosion of vessels, and carcinoma of the mouth, with gangrene of the lower lip” (Sellin, 41). There is no real mystery about David Lindsay. He was a little-known author who lived in Devon, and whose passion was, not literature, but music, and especially Beethoven (this comes out particularly in the first chapter of his second-best novel, The Haunted Woman). He wrote a considerable number of novels, mainly on religious or semi-mystical themes, though a straight historical novel was among them. He never achieved any kind of success, and died, I afterwards heard, in great penury. He was a delightful man – I had the privilege of meeting him twice; and he always believed, albeit with great humility, that A Voyage to Arcturus would find a reader or two every year for more or less as long as the English language existed (Hodges, 78-79). For biographical fact I have relied mostly on Bernard Sellin, The Life and Works of David Lindsay, transl. Kenneth Gunnell (Cambridge: Cambridge University Press, 1981), preferring it over the entry in the Oxford Dictionary of National Biography by the fantasy scholar Colin Manlove. The last quotation comes from Sheila Hodges, Gollancz: The Story of a Publishing House, 1928-1978 (London: Gollancz, 1978).